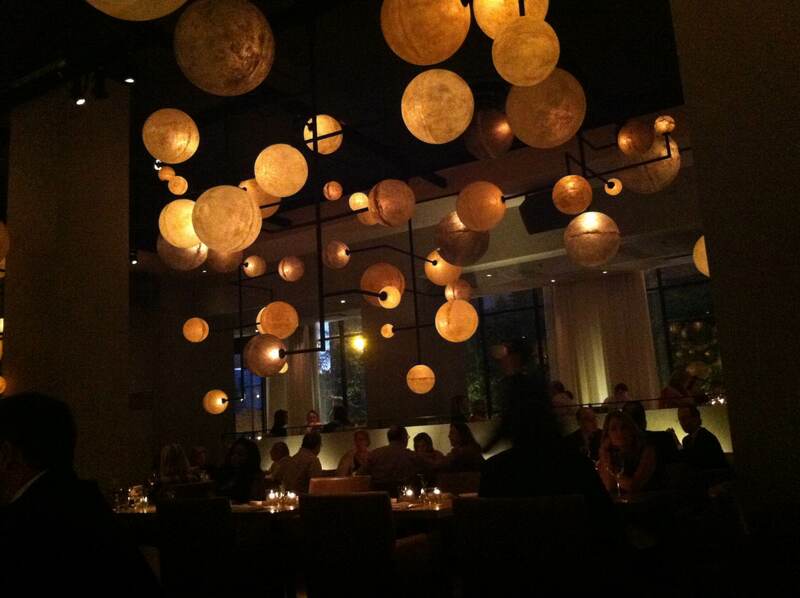 Last night I had the pleasure of dining at The Pump Room inside the Public hotel in Chicago. Zman and I had been planning a fancy date night this weekend but since we gorged ourselves on pizza for lunch, we wanted to save this restaurant for a day when we could really appreciate it. I’m so happy we did because this was a meal to remember. 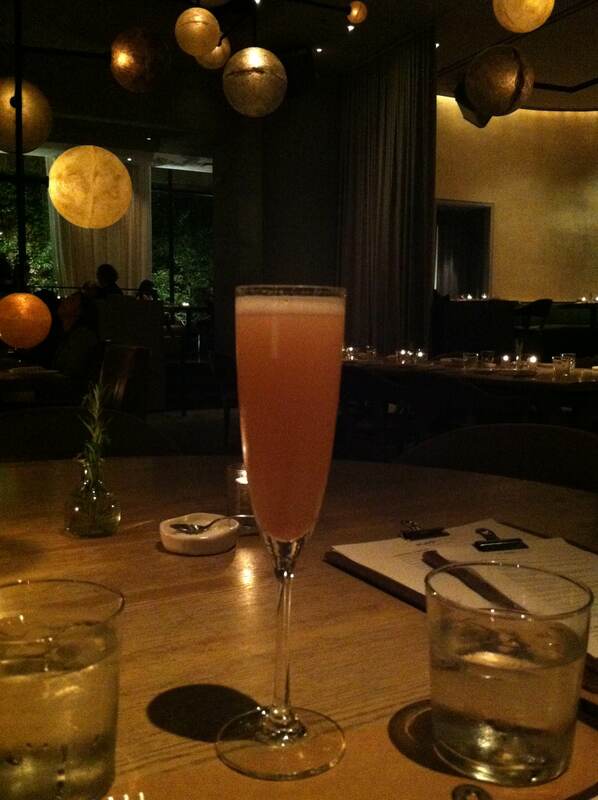 The minute we walked into the dining room we knew it was going to be an exceptional experience. I absolutely love lanterns and think it’s so cool when people incorporate them into decorations, so walking into a dim room full of these orbs was a pleasant surprise. Zman requested a booth when he made the reservation (the man knows he has a high-maintenance girlfriend…such a sweetheart) so we had a half-circle booth made for at least five people all to ourselves. It was so nice to sit next to each other and look out on the gorgeous dining room. The menus were handed out on clipboards. Such a pinterest-esque thing to do! We started with a Raspberry Lychee Bellini that we shared simply because we both feel guilty going to fancy places and not drinking. To be honest, Zman and I aren’t big drinkers. 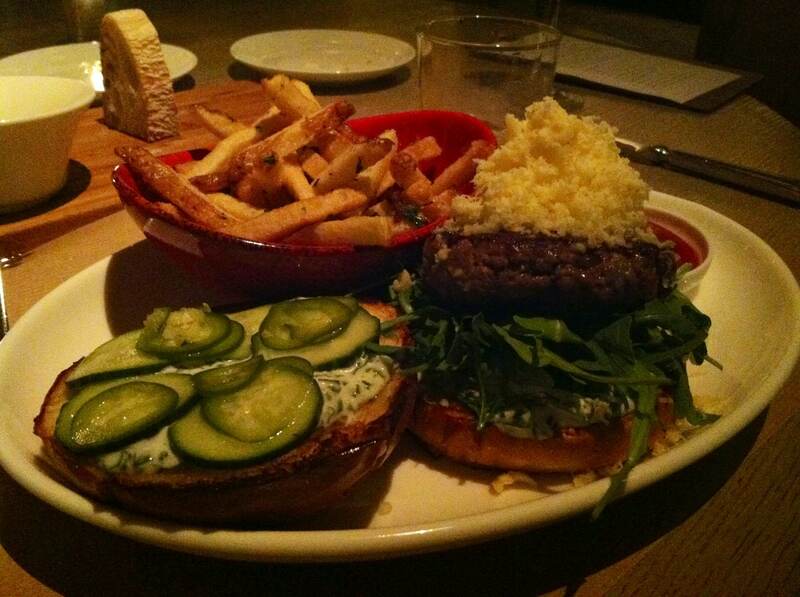 Sure we go out, but at meals you’ll never see us ordering beers with our burgers or wine with our pasta. I’d much rather save room for more food! The cocktail didn’t blow us away. It was a mix of La Marca Prosecco and homemade raspberry-lychee syrup but it just wasn’t sweet enough for what we were expecting. 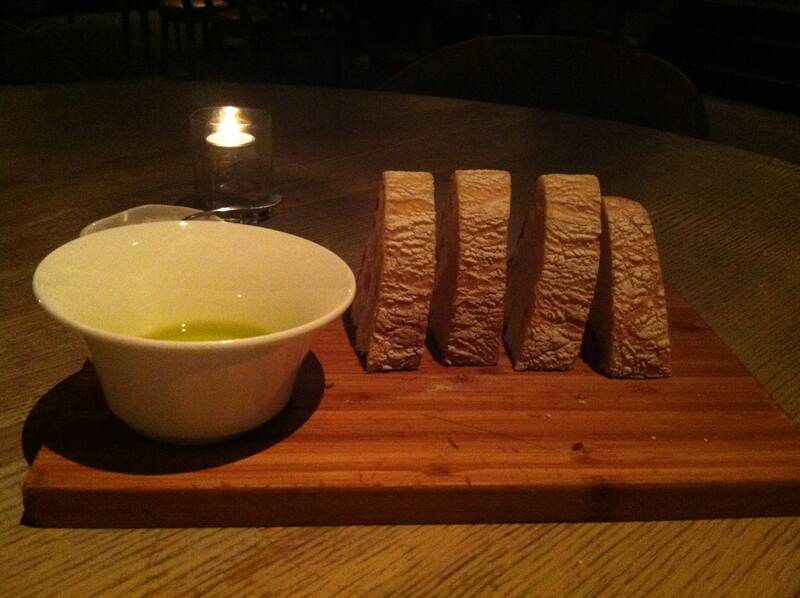 After we had placed our dinner orders, the server brought out a cutting board with slices of freshly baked bread, high quality olive oil, and a dish of sea salt. As an avid bread eater I’m used to seeing bread with parmesean cheese in this situation. But surprisingly I really loved the addition of sea salt on top of the bread. The salt and the oil seemed like they really brought out the flavor in each other. Who would’ve thought? Our food came out pretty fast for such a high-class place. We were expecting to be waiting an hour or so but everything was out in less than 20 minutes. I had researched The Pump Room and was initially excited for the crab toast and baked lobster. Sadly, the waitress explained to us that their suppliers from the East coast had said the product wasn’t up to quality so they had to temporarily keep it off the menu. At first I was disappointed, but then I realized how amazing it was that this restaurant stood by its standards. If the fish wasn’t going to blow me away like it normally would, why would I want it? They were totally upfront and honest about the issue and I really respect restaurants that do that. We looked to our server for other suggestions, since my research was thrown out the window. 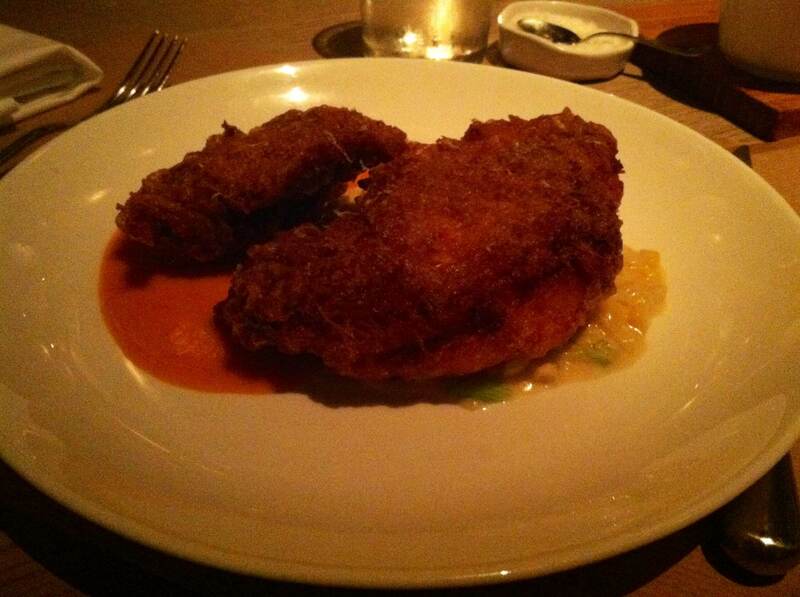 She recommended the organic fried chicken, something I have never had in my life. I would never have considered it normally, but she explained that it wasn’t actually fried the way I was thinking. It was two pieces of boneless chicken, a breast and a thigh, that is flash fried so it only retains 2% of the oil and still retains its natural moisture and health qualities. The intensity of the heat and the quickness of the exposure to the oil made it unlike anything “fried” I’d ever had. It tasted crunchy but not dry or greasy whatsoever. I would have never ordered this entrée without her input, and served over creamed corn and a sweet chili puree, it was delicious. Ok…now dessert. Sweet mother of GOD was dessert good. 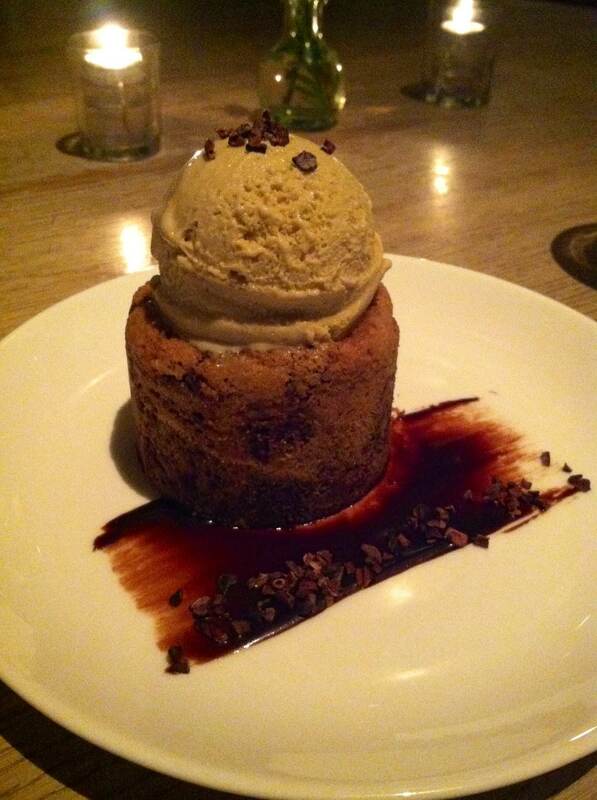 Deep dish cookie filled with chocolate and topped with chocolate malt ice cream. We finished this dish in three minutes. The minute I cut into it and the hot chocolate poured out of the cookie I let out an audible groan. It was such beautiful chocolatey goodness. I almost ordered another one. 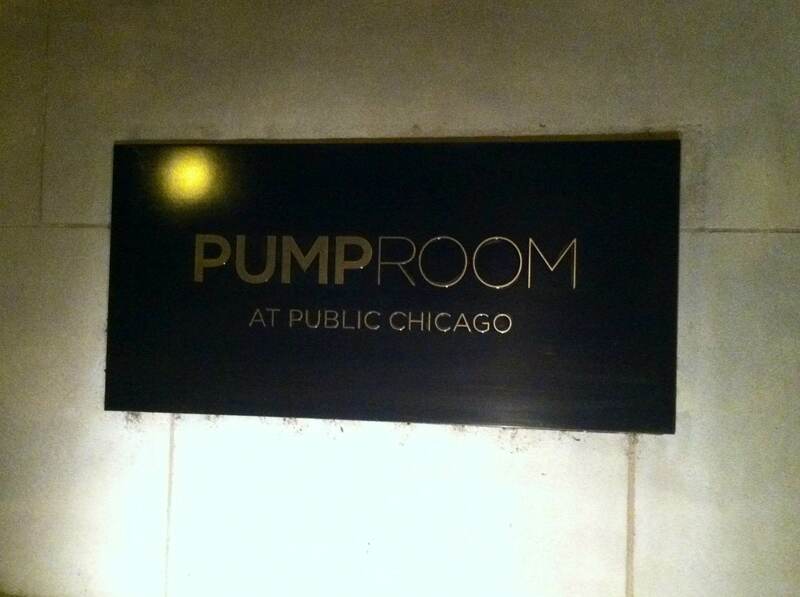 We will definitely be returning to The Pump Room. I can’t wait to try the crab toast and baked lobster, and I absolutely want to try every dessert that they have to offer. Maybe one night we’ll forgo dinner and just order one of each! We left the restaurant full but not overly stuffed, and it made our mile-long late night stroll full of conversation about how satisfied we were with the experience. Ummm jealous! 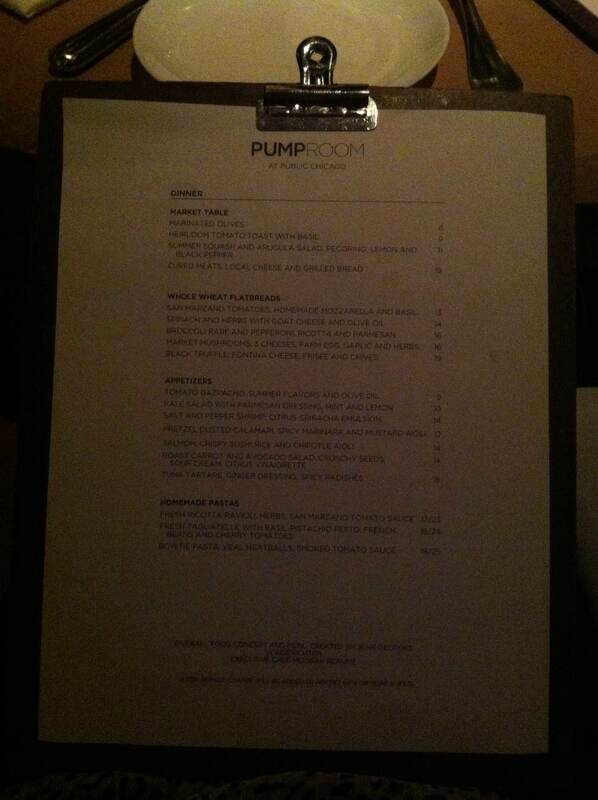 I have yet to go to Pump Room but I’ve heard great things. It sounds like an amazing spot!